7. How are food systems, diets, and health connected? Prevalence of undernutrition is greatest in Sub-Saharan Africa and South Asia. Undernutrition is rare in developed countries, although it can be a problem among the elderly (particularly those in institutions), those living with disease and among those with eating disorders. Micronutrient deficiencies are also more prevalent in lower income regions although they are also found in developed countries. Prevalence of obesity is greatest in high income countries. But the absolute number of obese people is greatest in middle income developing countries. In many developing countries, obesity is growing rapidly. This is a consequence of the nutrition transition. In very low income countries, obesity is rare but is nevertheless growing particularly in urban areas. Prevalence of obesity globally is higher in women than men. In developed countries obesity is associated with lower income. In developing countries, historically, obesity was associated with wealth. Today, it emerges initially among the most affluent but as the nutrition transition progresses, the relationship with socio-economic status changes and becomes more complex. Undernourishment means that a person is not able to acquire enough food to meet the daily minimum dietary energy requirements, over a period of one year. FAO defines hunger as being synonymous with chronic undernourishment. Anaemia is a common disease resulting from micronutrient deficiency (in this case iron). At the time of this study, the global prevalence of anaemia for the general population was 24.8% and it was estimated that 1620 million people were affected by anaemia. Prevalence was highest in Africa and South-East Asia. Similar regional patterns are seen for other deficiencies, such as vitamin A. World Health Organisation Vitamin A Deficiency map, 1995-2005. [online]. An estimated 250 million preschool children are vitamin A deficient, and it is likely that in vitamin A deficient areas, a substantial proportion of pregnant women are vitamin A deficient. Between 250,000 to 500,000 vitamin A-deficient children become blind every year, half of them dying within 12 months of losing their sight. The WHO has identified the following approaches to tackling the problem: promotion of dietary diversity (in particular consumption of vitamin A rich fruits and vegetables), fortification of staples (e.g. fats, oils, flour) and high-dosage supplementation. Promotion of breastfeeding is also an important element of prevention in infants. 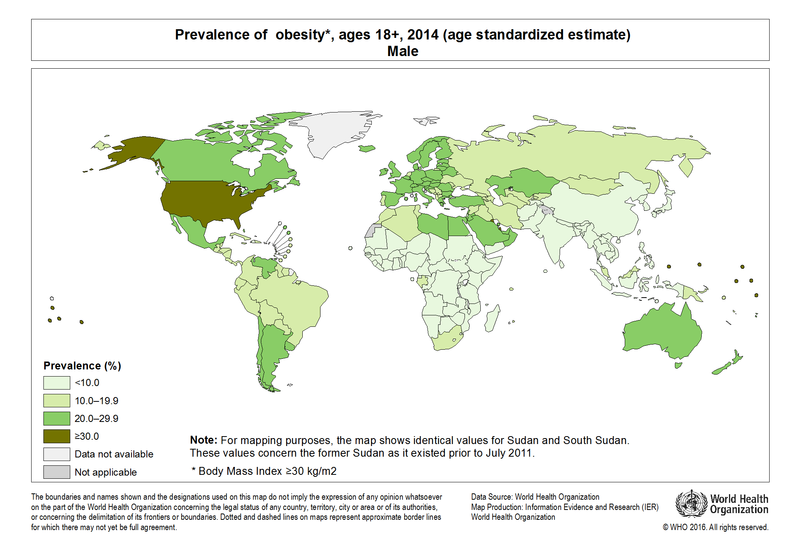 High income countries have the highest prevalence of adult obesity (male adult obesity is shown here). Countries with high prevalence of undernutrition (typically low income countries in Sub-Saharan Africa and South Asia, see above) have lowest levels of obesity. High income countries have the highest rates of obese/overweight adults as a percentage of population, but more obese or overweight adults now live in developing countries. Diets have been seen to change in line with rising incomes, with a shift from cereals and tubers towards foods high in energy, fat (including saturated) and sugar, including meats, processed foods, oils and fats. While fruit consumption also increases, vegetable and legume intakes decline. FAO World Hunger Map (2015). [Online]. WHO (2009). Global prevalence of vitamin A deficiency in populations at risk 1995–2005. WHO Global Database on Vitamin A Deficiency. World Health Organization, Geneva. De Benioit, B., McLean, E., Egli, I. and Cogswell, M. (2008) Worldwide prevalence of anaemia 1993-2005. WHO Global Database on Anaemia. Geneva, World Health Organisation. WHO World Prevalence of (Male) Obesity map (2015). [Online].